The study was led by César Terrer Moreno, a Ph.D. student at Imperial College London, and included researchers from Northern Arizona University, the University of Antwerp (Belgium), Indiana University and New South Wales University (Australia). The team synthesized more than 80 past experiments and found that higher CO2 boosted plant growth, as long as the plants received enough nitrogen. Without added nitrogen, CO2 had no effect, confirming the long-standing idea that nitrogen limits plant response to rising CO2. But there was a major exception: some plants—those with specialized partnerships with soil fungi—were able to respond to the extra CO2, just as much as if they had been fertilized with nitrogen. Most plants associate with mycorrhizal fungi, a partnership in which the fungus provides the plant with nutrients and water and receives food from the plant in return. But not all mycorrhizae are the same. Arbuscular mycorrhizal fungi specialize in taking up phosphorus from the soil, but not nitrogen, and plants that associated with arbuscular mycorrhizae were unable to respond to CO2 unless extra nitrogen was added. 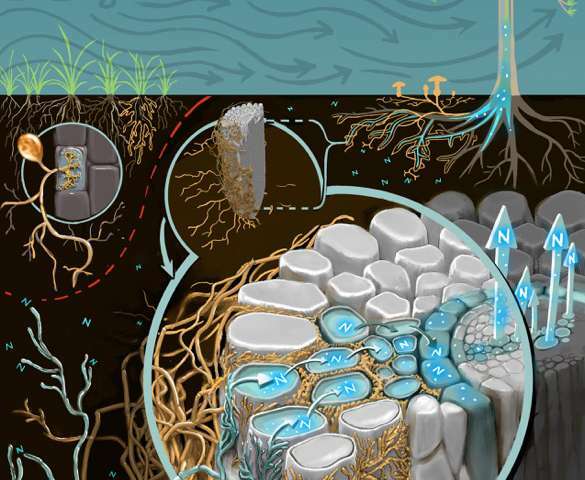 It was the plants that form ectomycorrhizal partnerships that responded to extra CO2 without any added nitrogen fertilizer, because these fungi produce enzymes that liberate bound nitrogen from soil organic matter, and the fungi can take up the nitrogen and pass some along to the plant. This synthesis helps resolve a long-standing debate about the role of nitrogen limitation for plant responses to CO2. Without enough nitrogen, it is thought that plants will be unable to respond much to rising CO2, and many experiments support this idea. But in some experiments where nitrogen is in short supply, the plants still grow more with elevated CO2, and the reasons have puzzled scientists for many years. The new synthesis offers a clear answer: "Plants need nitrogen to respond to high CO2, whether they find it readily available in the soil, or whether their mycorrhizal partners can help them get it," explained Hungate. The research should help project climate change into the future. Forests, grasslands and other ecosystems around the world currently absorb about 30 percent of human CO2 emissions, without which climate change would be happening even faster than it is now. The future of this terrestrial carbon sink depends on carbon accumulation by ecosystems through plant growth. This new research shows that it is essential to take into account mycorrhizal fungi, and suggests that the next generation of global carbon cycle models should include mycorrhizae as an important control point on plant responses to rising CO2 in the atmosphere. It is well known that grasses and herbs form arbuscular mycorrhizae, and that many trees form ectomycorrhizae. Since global carbon cycle models already recognize these different plant forms, adding mycorrhizae to models of the carbon cycle should be straightforward, and the team is already moving toward that goal.